How earthquakes happen? Where do most earthquakes occur? Why do earthquakes happen? How do earthquakes happen? Where are earthquakes most likely to occur? Why do earthquakes happen? Where in the world do most earthquakes occur? Earthquakes do not take place everywhere on the globe. By plotting the distribution of earthquake epicentres on a map, seismologists ﬁnd where do most earthquakes occur, but not all, earthquakes occur in fairly narrow seismic belts, or seismic zones. Most seismic belts correspond to plate boundaries, and where most earthquakes occur within these belts are called plate-boundary earthquakes. 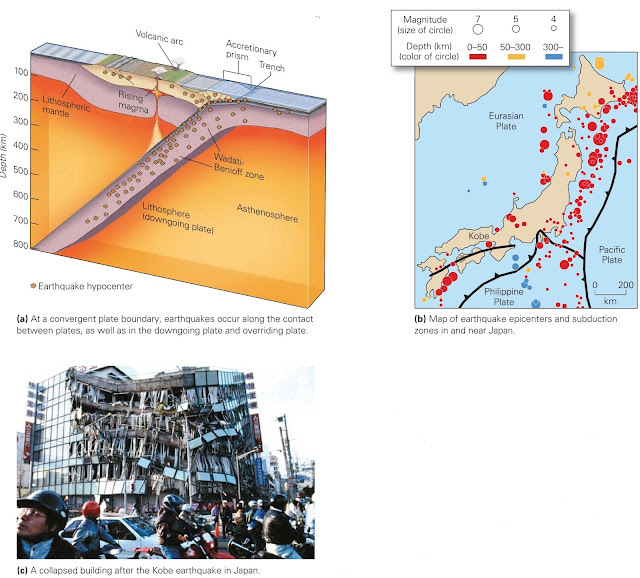 Earthquakes that occur away from plate boundaries are called intra-plate earthquakes (figure above). Eighty percent of the earthquake energy released on Earth comes from the plate-boundary earthquakes in the belts surrounding the Paciﬁc Ocean. Earthquakes do not occur at random depths in the Earth. Seismologists distinguish three classes of earthquakes based on focus depth: shallow-focus earthquakes occur in the top 60 km of the Earth, intermediate-focus earthquakes take place between 60 and 300 km, and deep-focus earthquakes occur down to a depth of about 660 km. Earthquakes cannot happen still deeper in the Earth, because rock at great depth cannot rupture or change in a manner that produces shock waves. In this section, we look at the characteristics of earthquakes in various geologic settings and learn why earthquakes take place where they do. As we've noted, the most earthquakes occur at faults along plate boundaries, for the relative motion between plates causes slip on faults. We ﬁnd different kinds of faulting at different types of plate boundaries. At divergent plate boundaries (mid-ocean ridges), two oceanic plates form and move apart. Divergent boundaries are broken into spreading segments linked by transform faults. Therefore, two kinds of faults develop at divergent boundaries. Along spreading segments, stretching generates normal faults, whereas along transform faults strike-slip displacement occurs (figure above). 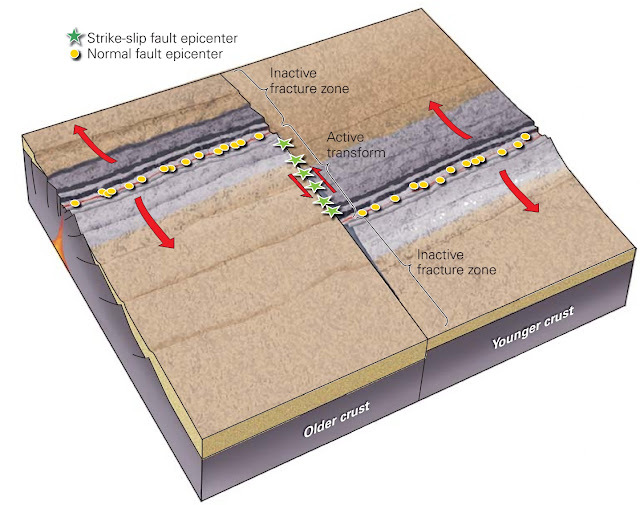 At transform plate boundaries, where one plate slides past another without the production or consumption of oceanic lithosphere, most faulting results in strike-slip motion. The majority of transform faults in the world link segments of oceanic ridges, but a few, such as the San Andreas fault of California, the Alpine fault of New Zealand, and the Anatolian faults in Turkey, cut through continental lithosphere or volcanic arcs. All transform-fault earthquakes have a shallow focus, so the larger ones on land can cause disaster. The 2010 earthquake in Haiti is a tragic example of such an earthquake (Box 8.1). As another example of a transform-fault earthquake, consider the slip of the San Andreas fault near San Francisco in 1906 (a in figure above). In the wake of the gold rush, San Francisco was a booming city with broad streets and numerous large buildings. But it was built on the transform boundary along which the Paciﬁc Plate moves north at an average rate of 6 cm per year, relative to North America. Because of the stick-slip behaviour of the fault, this movement doesn't occur smoothly but happens in jerks, each of which causes an earthquake. At 5:12 A.M. on April 18, the fault near San Francisco slipped by as much as 7 m, and earthquake waves slammed into the city. Witnesses watched in horror as the street undulated like ocean waves. Buildings swayed and banged together, laundry lines stretched and snapped, church bells rang, and then towers, facades, and houses toppled. Judging from the damage, seismologists estimate that the largest shock would have registered a seismic moment magnitude of 7.9. Most building collapse took place down-town. Fire followed soon after, consuming huge areas of the city, for most buildings were made of wood (b in figure above). In the end, about ﬁve hundred people died, and a quarter of a million were left homeless. 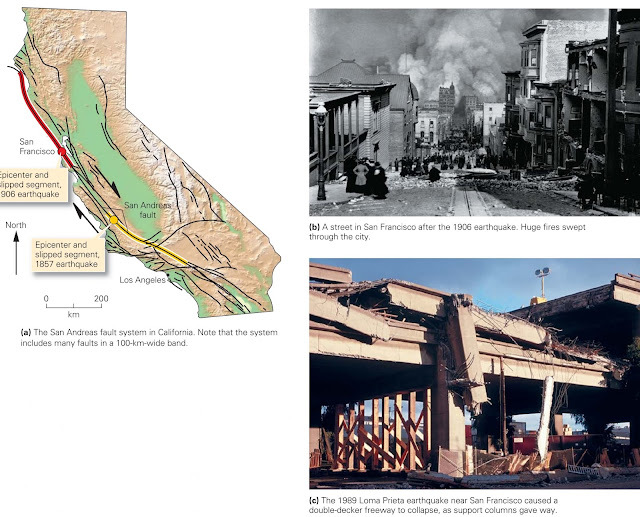 The San Francisco earthquake has not been the only one to strike along the San Andreas and nearby related faults. Over a dozen major earthquakes have happened on these faults during the past two centuries, including the 1857 magnitude 7.7 earthquake just east of Los Angeles, and the 1989 MW 7.1 Loma Prieta earthquake, which occurred 100 km south of San Francisco but nevertheless shut down a World Series game and caused the collapse of a double-decker freeway (c in figure above). Convergent plate boundaries are complicated regions at which several different kinds of earthquakes take place. Shallow-focus earthquakes occur in both the sub-ducting plate and the overriding plate. Speciﬁcally, as the down-going plate begins to subduct, it scrapes along the base of the overriding plate. Large thrust faults develop along the contact between the down-going and overriding plates, and shear on these faults can produce disastrous, shallow earthquakes. In some cases, the push applied by the down-going plate compresses the overriding plate and triggers shallow earthquakes in the overriding plate. In contrast to other types of plate boundaries, convergent plate boundaries also host intermediate-focus and deep focus earthquakes. These occur in the down-going slab as it sinks into the mantle, deﬁning the sloping band of seismicity called a Wadati-Benioff zone, after the seismologists who ﬁrst recognised it (a in figure above). These earthquakes occur partly in response to stresses caused by shear between the down-going lithosphere plate and surrounding asthenosphere, and partly by the pull of the sinking deeper part of the plate on the shallower part. Why can intermediate- and deep-focus earthquakes of a Wadati-Benioff zone take place? Shouldn't the rock of a subducted plate at these depths be too warm and soft to break seismically? Seismologists have determined that rock is such a good insulator that the interior of a plate actually remains cool enough to break seismically, even down to a depth of about 300 km. And they found that at the extreme pressures developed in deeply subducted lithosphere, certain minerals can suddenly collapse to form new, denser minerals, a process that could generate an earthquake. Earthquakes in southern Alaska, eastern Japan, the western coast of South America, the coast of Oregon and Washington, and along island arcs in the western Paciﬁc serve as examples of convergent-boundary earthquakes. Some of these earthquakes are large, and occur near populated areas, so they can be devastating. Notable examples include the 1960 MW 9.5 earthquake in Chile, the largest earthquake on record; the 1964 MW 9.2 Good Friday earthquake near Anchorage, Alaska; the 1995 MW 6.9 earthquake in Kobe, Japan, which devastated the city (b & c in figure above); the 2004 MW 9.3 Sumatra earthquake, which triggered the giant Indian Ocean waves that killed 230,000 people; the 2010 MW 8.8 Chilean earthquake; and the 2011 MW 9.0 Tohoku earthquake, which also triggered a tsunami. The stretching of crust at continental rifts generates normal faults (figure above). Active rifts today include the East African Rift, the Basin and Range Province (mostly in Nevada, Utah, and Arizona), and the Rio Grande Rift (in New Mexico). 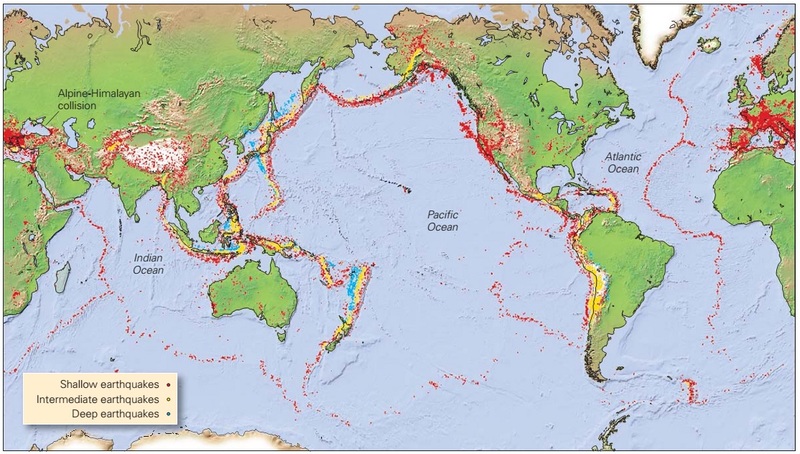 In all these places, shallow earthquakes occur, similar in nature to the earthquakes at mid-ocean ridges. But in contrast to mid-ocean ridges, these seismic zones can be located under populated areas, and thus cause major damage. Two continents collide when the oceanic lithosphere that once separated them has been completely subducted. Such collisions produce great mountain ranges such as the Alpine-Himalayan chain and caused the catastrophic 2005 earthquake in Pakistan. Though a variety of earthquakes happen in collision zones, the most common result from movement on thrust faults (see figure above). The magnitude 9.0 earthquake that occurred in Lisbon, Portugal, on All Saint’s Day, November 1, 1755, serves as an example of a collision-related thrust event. The event happened when stresses arising from the northward push of Africa against Europe caused a thrust fault beneath the Atlantic Ocean ﬂoor west of Lisbon to slip. The resulting ground shaking toppled 85% of the city’s buildings. Fires set by overturned stoves then consumed much of the wreckage. Uplift of the sea ﬂoor by the thrust movement also produced a tsunami that inundated the coast and washed away Lisbon’s harbour. Not only did the catastrophe destroy irreplaceable structures (including the library that housed all the records of Portuguese exploration) and countless Renaissance artworks, but it led the intelligentsia of that time to question long-held beliefs about philosophy. Inﬂuential works by Voltaire (1694–1778) address the philosophical implications of the event. Some earthquakes occur in the interiors of plates and are not associated with plate boundaries, active rifts, or collision zones (Divergent plate-boundary seismicity figure). These intraplate earthquakes account for only about 5% of the earthquake energy released in a year. Almost all have a shallow focus. What causes intraplate earthquakes? Most seismologists favour the idea that force applied to the boundary of a plate can cause the interior of the plate to break suddenly at weak, pre-existing fault zones, some of which may have formed initially during the Precambrian. In Europe, a number of intraplate earthquakes have been recorded. For example, an earthquake with a magnitude of 4.8 hit central England, near Birmingham, in 2002. In North America, intraplate earthquakes occur in the vicinities of New Madrid, Missouri; Charleston, South Carolina; eastern Tennessee; and Montreal. A magnitude 7.3 earthquake occurred near Charleston in 1886, ringing church bells up and down the coast and vibrating buildings as far away as Chicago. In Charleston itself, over 90% of the buildings were damaged, and sixty people died. In 2011, a magnitude 5.9 earthquake struck central Virginia, abruptly reminding residents of the eastern United States that the region is not immune to seismicity. The tremor was felt from the Carolinas to New England. 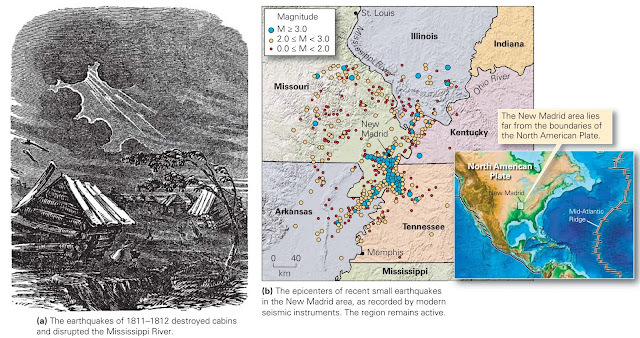 The largest intraplate earthquakes to affect the United States happened in the early 19th century, near New Madrid, which lies near the Mississippi River in southernmost Missouri. During the winter of 1811–12, three magnitude 7 to 7.4 earthquakes struck the region. Displacement of the ground surface temporarily reversed the ﬂow of the Mississippi River and toppled cabins (a in figure above). The earthquakes resulted from slip on faults that underlie the Mississippi Valley (b in figure above). Both St. Louis, Missouri, and Memphis, Tennessee, lie close to the epicenter, so major earthquakes in the area now could be disastrous.